Schedules are automated user-defined actions, which can be performed through custom functions either at a particular time or on a recurring basis. User-defined actions enable creating unique scheduling situations that can be executed periodically based on your requirements. You can now schedule a custom function such that it is executed automatically on a daily, weekly or monthly intervals. Push your Recruit Data to your legacy system for data-back up purposes. Alert the users about any idle candidates or job openings. Profile Permission Required: Users with Manage Workflow permissions can configure schedules. Click (the Settings icon) > Setup > Automation > Schedules. Click Create your First Schedule. Enter a name and description to the Schedule for easy identification. Choose an Execution Start date and Execution time to which the custom function should be executed. Set schedule frequency from the available drop-down list. You can set schedule frequency either once or on a daily, weekly, monthly, or yearly basis with specific date/time and recurring frequency. Choose the schedule frequency as either Once, Daily, Weekly, Monthly or Yearly, in the Frequency field. For example, if you choose to set frequency on a monthly basis, then the scheduled custom function will be executed on a monthly interval. 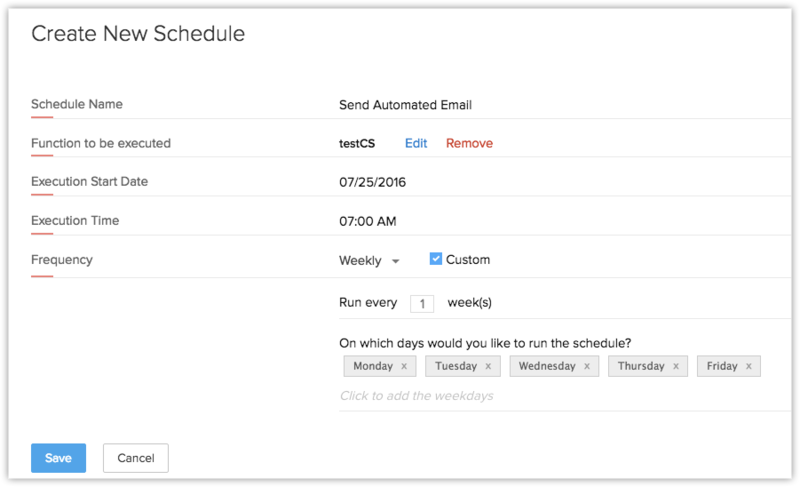 Enable the Custom checkbox to run the custom action either on any specific day/month/year along with recurring frequency for your schedule. For example, if you choose to run the schedule every month, you can repeat the schedule on any specific day of the month. Use the Run Now option in the schedule configuration page to manually trigger the scheduled function whenever required. You are allowed to trigger the schedule manually only twice per day. Every schedule should be associated with a custom function. Using our Deluge Script Editor, you can write your own custom function and schedule it to execute periodically. See alsoDeluge Script - Reference Guide . All the failed schedules will be logged and displayed on the Failure tab of the Schedules configuration page. These data will be available as long as it is available on the Recruit Audit logs. The failed scheduled actions will be retried ever 15 minutes from the failure time. You can edit the existing custom schedules whenever required. Only the users with manage workflow permissions can edit schedules. Select the required schedule from the list and click the Edit icon. Edit and update the changes as per your requirements. Choose the required schedule that you want to delete and click the Delete icon. Every organization can have only 10 active schedules. You are not allowed to duplicate a schedule name. The start date of a Schedule should not exceed 90 days from the current date. Every schedule execution details will be logged in Recruit Audit Logs.